Real Estate | Indian Stocks & markets, Real Estate, Personal Finance – What I see, read and think you find it here. I always had an impression that land grabbing and wrongful transfer of properties without the actual owner being aware of this happens to individual buyers or sellers in the Indian market. But it has started impacting developers as well. Recently I cam across two legal notices/advertisements in leading newspapers given by Wellwin Industry against Chitra Anandan Constructions for a property in Perungudi and the other one by Ozone developers. There were advertisements by both the buyers and sellers in both the cases on back to back days. In this case, a subsidary company of Wellwin Industry was sold lock, stock and barrel to Chitra Anandan Constructions as per the advertisement of Chitra Anandan constructions. The subsidary company is the legal owner of the land and Chitra Anandan constructions is building a residential complex in this land. Wellwin Industry has refuted the claim of Chitra Anandan Construction saying that the land still remains with them. Ozone developers contends that they have legally bought the land from the owners and they are in rightful possession. The land in question I guess is a hereditary land running into few centuries!! When I checked their website, they have a project coming up in Anna Nagar, Chennai and I am not sure if this pertains to their Anna Nagar project or any other land they have bought. The buyers go to this organised players primarily to avoid legal issues in ownership. And now we are hearing about legal disputes even on lands/properties developed by reputed builders. I was recently told that even Ceebros Shyamala Gardens project ( being built on Shyamala studio land) at Saligramam has some legal issues. It is really vexing for individual buyers if they have to face these legal issues even after paying hefty premiums. Now buying a house without any legal issues boils down to your luck!! Interest on Real Estate is on the wane? We visited the property fair put by JBJ City Developers at Valluvar Kottam. We have not visited any property fair for quite some time now, so we were all perked up when we landed there. But to our great surprise and astonishment, the fair had very few companies who have come to exhibit their properties. May be, 15 companies totally. JBJ, being the lead sponsor, occupied the biggest space in the exhibition. JBJ, we learnt has properties across Tamilnadu and in this fair they show-cased properties which are closer to Chennai. No big builders were there in the fair. The crowd was very less and I would say hardly anybody. The properties on exhibition were very few and the price range of the plots were also inclined more towards the low-budget. Though you cant take this as the benchmark for real estate prices and the interest factor among the buyers, but it is surely an indication of where the real estate market is heading towards, Down! Last Sunday out of nowhere, we decided to go for a drive on the Old Mahabalipuram Road to have a glimpse of the latest developments on that road. We started little late in the evening around 5.00 PM and by the time we reached Madhya Kailash, it was already 5.30 PM. Luckily, due to the summer, the natural light was on and we decided to drive down the road. We were of the opinion that the road would be bad but to our surprise we found that the 6 lane road is almost complete for the entire stretch of 30 kms from Madhya Kailash. There were patch works and median work pending in few areas but overall the road has been laid and it made the drive hassle-free. I was surprised to see the large scale developments happening on the road through the entire stretch of 30 kms. I remembered some author writing about China. Their national bird is the huge cranes used for building construction. You find it everywhere on OMR too. After driving for more than 30 kms on the OMR we decided to turn back and then we saw the board of “Chennai Pattinam“, a housing project promoted by CEEDEEYES. Since our intention was not for visiting any particular real estate projects, we deliberated for few minutes whether to go and see Chennai Pattinam or drive back. Having come all the way, we decided to visit the site to get first hand information. Chennai Pattinam is a good 6.5 kms from OMR. The road is a narrow 20 feet road winding through vacant lands but the good thing is it is a metal road. There were road signs put for Chennai Pattinam so we didnt ask anybody for directions. Chennai Pattinam, is a residential project coming up on 55 acres of land near Tiruporur on the OMR. Actually the site is on the foot of a small hill so when completed it would be a pleasant site to watch the verdant hills. There is no development close to Chennai Pattinam site except for a reasonably big Shiva temple within 500 metres of the site. At the time we went, there were no project guys in site and we could not expect it as well. We were at the site at 6.30 PM on a sunday evening and reached unannounced. The construction work has started on the site and we could see pillars being raised. CEEDEEYESS is offering Chennai Pattinam at Rs2075 per sq.ft all inclusive. They have already raised the prices by Rs100/- per sq. ft since the time they launched couple of months ago. Price wise it is one of the cheapest projects which is getting advertised. Since it is a good 7 kms from OMR and 13 kms away from GST road, CEEDEEYES is planning to offer shuttle services to OMR and GST, of course, at a charge. We started back and reached Ascendas IT park where we planned to go for the dinner. Since Mcdonalds have opened their outlet in the food court, we went there to find a huge crowd. Honestly, I didnt expect that crowd on a sunday evening. Mac is a big hit in Chennai and we saw a queue of around 50 people to order food at Mac. When we turned around we saw a similar number waiting to order at KFC. We patiently waited for 10 minutes to order our food and I have to admit the systems at Mac are very efficient and we got our veg. burgers, potato widges and french fries in less than 5 minutes. Anugraha Satellite Township closer to Pondicherry!! Couple of months back when I was seriously looking for a real estate investment, I came across an advertisement of Satellite Township near Pondichery named Anugraha Satellite Township, near Pondicherry, promoted by Navasakthi Promoters. This satellite township is located 9 kms before Pondicherry but on the Tamilnadu side. 3. they are building a township of around 1000 houses which itself creates a community. 4. they were quoting a rate of around Rs1200/- per sq.ft. Where do you get a piece of real estate at Rs1200/- sq.ft? The township consists of more than 1000 houses in three categories named Economy, Elegant and Elite. Each one of these houses are built up on a land area of 2400 sq.ft and has built up area measuring according to the type of the house you are buying. The township comes with host of amenities like Vinayagar temple, gym, tar Roads, street lights, children play area, shopping complex and security systems. Visit the website of Navasakthi Promoters by clicking here. I was looking at it positively because it is closer to Pondicherry and when I spoke to the promoters they informed that the township is surrounded by engineering colleges and a medical college as well. There is a perennial rental demand in this area due to the presence of high number of colleges. The students and staff members of these colleges prefers these houses around their college. For a 2000 sq.ft house, you can get a minimum rent of Rs10000. I worked out the arithmetic and the total cost would be be around Rs25 lakhs. If I am able to contribute 20% as my initial contribution, the rest of the money would come as a loan. With a rental value of around Rs10k a month, the net liability towards loan servicing at ongoing rates would be around 10k per month, which I thought could manage. Thought about it for a long time but decided to let go since I didn’t want to commit for a new loan. A new housing loan at this stage for another 10-15 years would perennially challenge my desire to break free from a job. If the rental value as claimed by the promoter turns out to be true and with Pondicherry developing over the next few years, it would be an ideal investment /retirement property. Please check out with the promoters what is the current rate quoted by them. I am still waiting for my retirement property, though!! Gangaikondan IT Park at Tirunelveli – Taking IT/ITES to Tier II cities in Tamil Nadu!! The Tamilnadu Government has been actively promoting the IT SEZ’s in places outside Chennai. One of the IT SEZ’s promoted by ELCOT, a TN state government enterprise is at Gangaikondan near Tirunelveli. Tirunelveli is a Municipal Corporation comprising of the twin towns of Tirunelveli and Palayamkottai situated on the banks of the river, Thamirabarani. Tirunelveli boasts of excellent infrastructure like good educational institutions, basic urban infrastructure, medical facilities and is well connected by Rail, Road and Air. Palayamkottai is hailed as Oxford of South India considering the existence of venerable educational institutions like St. Xaviers College, St.Johns College, Sarada College for Women, Government Engineering College and Government Medical College. In addition to that, there are atleast 25 reputed Engineering colleges churning out of number of graduates year after year in and around Tirunelveli in a radius of 200 kms. 3. there are thousands of IT employees from southern districts currently working in other places would be interested in going back. The person behind the show from the Government side is Mr Umashankar who has a very high reputation of honest and straight-forward officer. He works with missionary zeal in this regard and he has done road-shows across the country. Very unusal of a Government servant, I guess!! Already four companies have committed to set up operations in the Gangaikondan IT SEZ including the likes of Hexaware, Sutherland Technologies etc. ELCOT is offering an acre in IT SEZ for Rs15 lakhs for a 90 years lease. Does this throw up opportunities in the real estate sector? Yes, it definitely throws up an opportunity. There are various real-estate projects coming up in and around Tirunelveli. Yesterday’s The Hindu had a special focus on south based cities like Tirunelveli and Madurai. Sensing this development around Tirunelveli, the real estate prices in Tirunelveli town area, I know of, has already gone up 2-3 times in the last 1 year. If you have local contacts it definitely helps. One promoter who has many projects closer to IT SEZ is Jenisan Land Promoters. I enquired about the plots they have advertised and got an immediate response with the complete details of the project as well as the legal complete document set. It gave me the confidence on the promoter as he was willing to share the legal documents. I think I should have a closer look at Tirunelveli on the real estate front!! Kancheepuram plots – moving closer to a decision!! I earlier wrote about the fact that I was looking for plots in and around Kancheepuram. I briefly talked about my interest in buying a piece of land in Kancheepuram here and also listed couple of reasons for the same. I have visited Kancheepuram for atleast 3 times in the last one month to look at various options. I normally go along with my friends who are also interested in buying land in Kancheepuram. It also brings in different views/perspective to the whole exercise, which is very important. When we checked about the plots available for sale, we found out that there are not many established players in the market. Only of couple of established players like BLB Real Estate and The Lands have their layouts. For instance, BLB’s property is in Vaiyavoor (4 kms from Kanchipuram town) and the lay-out of The Lands is 5 kms away from the town very close to the national highway. Major developments with regard to Kanchipuram happens on the National Higway and I consider it is better to have direct road access to NH from the lay-out. The real estate in Kancheepuram is still virgin and the big players have not come out with lay-outs. The market is dominated by local real estate agents and housing societies. There are no or very minimum lay-outs with DTCP approvals. 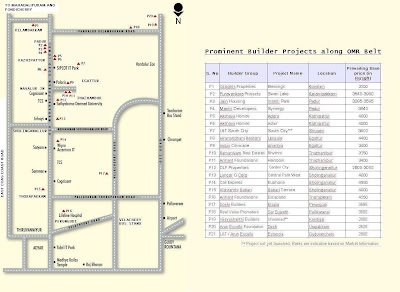 Majority of the plots are panchayat approved plots. High number of plots are coming for re-sale after the recent price surge on the Kanchipuram stretch. The Kanchipuram town bus stand is going to be moved to the National Highway thereby easing the traffic congestion within the town. The proposed new bus-stand is on the National Highway near the Kanchipuram arch. 1. Enathur – Kanchipuram stretch – This is where the Sankara Deemed University is situated. There are 4 or 5 layouts which are bang opposite the university. The prices quoted for them is around Rs400 – Rs500/- per sq.ft and most of them are DTCP approved. The lay-outs are 1.5 – 2.00 Kms from the NH and 2.5 – 3.00 Kms from the Kancheepuram town. 2. Enathur – Vaiyavoor stretch- This is again a big property market with hundreds of plots available for sale. Almost all of them are panchayat approved plots with the price range between Rs100 – Rs200 per sq.ft. There is not much habitation around and also it is further away from NH, say almost 6 kms from NH. BLB has a DTCP approved layout in Vaiyavoor which is 4 kms from Kanchipuram town. Please be aware that Vaiyavoor is the earmarked place for garbage dumping of Kanchipuram municipality!! 3. Vellai Gate area – This is a popular landmark on the NH near Kanchipuram and it is good 2 kms away from the town’s entry point. There are plots in this area as well selling between Rs100 – Rs300 per sq.ft. 4. Parandur – Karai stretch – All the above are on the left hand side of the NH if you go from Chennai to Kanchipuram and this Parandur – Karai villages are situated on the right hand side of the NH. Karai is the bigger village among the two, I guess and it is very closer to the NH. There is a big lake near Karai and there are plots available abutting the lake at a lower price. The property I am interested to purchase is on the Parandur road on the opposite side to the Kanchipuram entry arch. The property is exactly 3 kms from the National Highway, panchayat approved and on a 30 ft tar road. The property is fully compounded and it was earlier a coconut farm which is being converted into residential plots. The project is marketed by Employee Welfare Society (Regd No.52). The size of the plot is 1320 sq. ft (22 ft X 60 ft). If you are interested you can contact Mr Gopi on 9381441442. Why I have chosen this property compared to other sites I have seen? 1. The property is on a 30 ft metal road with bus service (though not very frequent). 2. The property is fully compounded which reduces considerably the risk of enroachment. 3. With the Kanchipuram town bus terminus moving to the NH, the distance to the bus terminus is only 3 kms, which I think is very positive. 4. It is near a water body (Lake) which will help sustain the ground water level. DLF launches GARDEN CITY on OMR in Chennai!! Pls click on the image to enlarge. The much awaited DLF Homes have come to Chennai. DLF has recently launched the Garden City on OMR at an attractive price point of Rs2800/- per sq ft. I learn that ICICI Home Search is doing the pre-launch advertising. The Garden City is spread across 58.5 acres and I guess there would be some 3000 apartments in the township. The township provides lot of amenities like Hospital, Clubhouse, School (Padma Seshadri School) etc., If you read through the pre-launch offer, there are no approved plans yet but it seems already 400 flats have been blocked by prospective buyers. It has made a very good opening and lets see how this pans out in the weeks to come. I think DLF wants to enter the Chennai market and hence offering a lower price. It also needs to build some kind of brand awareness, though not to a very great extent after their IPO. we need to wait and see what the other players who already has projects lined up in that OMR stretch does with the pricing. With this kind of aggressive pricing by DLF, will it have a cascading effect on the overall real estate prices in Chennai? What do you say? The entire project brief is given below. I have also attached the route map. DLF is about to launch an integrated township GARDEN CITY on OMR in Chennai. The project will have luxury apartments – 2 / 3 BHK / school / hospital / mini mall / guest rooms / 125000 SFT Clubhouse with indoor and outdoor games facility – among many more luxury amenities. DLF group, the leading real estate developer in India, with over 224 mn sq ft of existing development and 738 mn sq ft of planned project. The group which has set standards in real-estate industry with mega-township projects like 3000 acres DLF city. After NCR the developer has entered other markets in the country with successful launches in Kochi and Kolkata. The same expertise and technical finesse is now being bought in Chennai. Total land extent of 58.5 acres. 32 blocks with Stilt+19 floors, Basement and surface car parking. Project Location: The project is tucked away in neat corner of Semancheree, on OMR. Behind Sathyabhama University. Convenient to the entire IT destinations TIDEL PARK / SIPCOT IT PARK Siruseri / ASCENDAS / Infosys / Wipro / TCS / Cognizant etc. The project will have a school by the Padmaseshadri institutions- who run some of the finest schools in Chennai. A Mini mall with department store, washing facility. A health care centre run by Fortis group. It will also feature a ten bed mini hospitals for medical emergencies with ambulance facility. A top end clubhouse of 125000 sft ( largest in South India ) with all modern facilities. It will feature 75 room guest house ( 4-5 star category ). Among the facilities the most notable is the availability of trained servants / cooks / drivers for household. It will also have tenant service by DLF as per client choice. Completion: The project completion will be 24-30 months from launch. The booking amount will be 15% of total property cost. Price: The expected launch price for Phase 1 ( first 700 flats ) is around 2800-3000/sft. A premium of Rs. 100/sft will be applicable for flats facing landscaping. Floor rise of Rs. 30/sft will be applicable from 4th floor onwards. This pricing is nearly Rs. 700- Rs. 1000/sft less compared to other similar projects on OMR. Pl refer OMR project eye attached. Approx 2bhk will start Rs. 35L onwards and 3BHK will start Rs. 45L onwards. Booking procedure: You need to pay Rs. 500000/- ( RS. 5 lacs ) in favour of DLF SOUTHERN HOMES PVT. LTD. Please indicate the flat area / premium or non premium pacing / floor range so that a tentative booking can be done in this soft launch scheme. The exact unit can be freexed once the plans are available ( around Jan 1st week ). Desire to own a farm land drove me to a corner of Chennai!! My interest to buy a piece of land at a low price with excellent prospects for appreciation in value in the near term (am I asking for the moon!!) took me to a place called Poondi in the outskirts of Chennai last weekend. Poondi, is famous for its resorvoir than for real estate. Last Saturday’s The Hindu Property Plus exclaimed of a farm land near (!) Chennai at Rs30 per sq.ft. Myself and my Brother in Law could not resist the temptation of becoming a farm land owners at a very cheap price and called the real estate agent to arrange for a free site visit. In Chennai, almost all real-estate agents provide you with free site visits in the comfort of a car. We were supposed to be picked up at 2.30 PM in the afternoon to go to Poondi which according to the real estate agent is 60 kms away from Chennai. Nobody turned up till 2.45 PM and we called him to find out that he is finding difficult to get a cab from his office pool of cabs to take customers to various sites. Finally he arrived at 10 minutes to 4 PM. The real estate company’s salesman came in a Tata Indica Car with one more customer already sitting pretty. Both of us got into the car and it became a fully-loaded Tata Indica Car of 5 persons!!!! We went through Tiruvellore and re-kindled memories of the missed opportunities in 2005-06. We particularly remember a real estate project just in front of District Collector’s selling at Rs175 per sq.ft. We went and saw the property and we had to say “no” because of the reason that the site is below the road level. Today the same property is selling at Rs600 per sq.ft. Poondi village is 16 kms from Tiruvellore and it took us more than 40 minutes from Tiruvellore to wind through the narrow village roads before reaching the farm lands. The property is a Mango farm spread over 120 acres which is being split into sub-units and sold to prospective farm land owners. The cost per acre of a farm land at Rs30 per sq.ft comes to a staggering Rs13 lakhs. The property is a good 6 kms from the Poondi resorvoir and there is no human habitation to be seen in the vicinity. My BIL was not impressed with the property since there is no sign of any development happening in the near future and he felt that it is in the middle of nowhere. He has a very good sense of these real estate deals and I agreed to his judgement. We decided to look at some other property which fits into our scheme of things. The property spread over 120 acres at ongoing rate of Rs13 lakhs works out to Rs15.60 crores. At what rate the land owner would have brought the 120 acres of land say 5 years ago? May be the entire plot of 120 acres would have cost him Rs1 crore? World’s 5th most powerful women buys an apartment in Chennai!! Indira Nooyi, the CEO of Pepsico has concluded a property deal in Chennai. She has purchased a 4100 sq.ft flat promoted by KGEYES Residency in Poes Garden area. Poes Garden is already posh with Ms Jayalalitha, former CM of Tamilnadu and Mr Rajnikanth, the superstar of Tamil Cinema. Now Indira Nooyi joins this exclusive list of people owning a residence in Poes Garden. The builder KGEYES Residency has sold this property at the rate of Rs16000 per sq.ft. The total cost of flat comes to around Rs7 crores. (Equivalent USD1.7 Mio). This is a small sum for Indira considering her last year’s salary, I guess. The details of Indira Nooyi’s salary as reported in http://www.sajaforum.org/. Indira Nooyi earned $6,230,366 in Total Compensation last year. Another piece of information on Indira Nooyi. She is the niece of ace Carnatic Musician Ms Aruna Sairam.